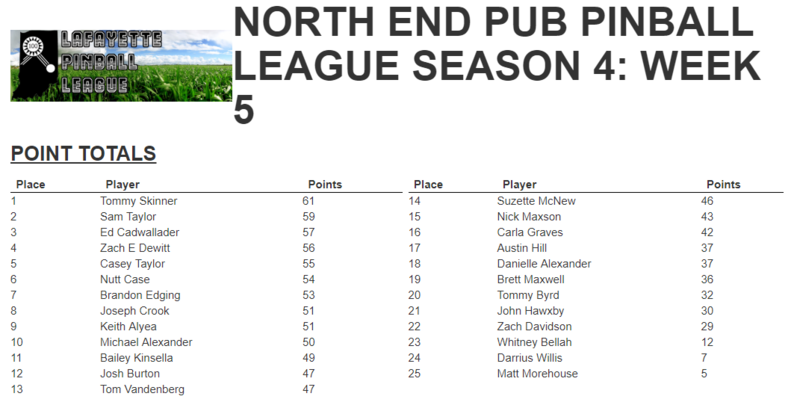 Week 5 Standings for North End Pub Pinball League! Here are the standings after getting in the scores from Make-Up Monday! A reminder that it is FREE PLAY WEDNESDAY! A great night to submit scores for this month’s Selfie Tournament on Metallica and Old Chicago! We have league tomorrow night but NOTICE THAT THERE IS NO LEAGUE NEXT THURSDAY, OCTOBER 18th! We will pick back up the week after on the 25th and then finish the regular season on November 1st. Our finals tournament will take place the week after that on November 8th to crown the new Champion of North End Pub!